Prior to flying out we had already booked our seats, upstairs exit row. So we already knew where we would be sat, which is a bonus because then you don’t have to work out where your seats are once you are on the plane. Sitting upstairs is a bonus in itself, you are the first to board the plane after First Class and Premium Economy, you are also the first people off the plane. This is because it is quicker and easier to take the 60-90 people off of the top level first than it is to wait for 300 people to leave from downstairs. 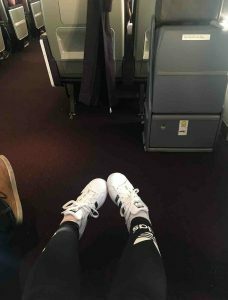 Personally I feel like with the benefits of: boarding quickly, leaving the plane first, getting served first and having all the extra leg room is definitely worth the extra £300 (approx) that we paid for the seats. The flight from Manchester to Orlando (VS075) was a really nice flight, it was the longer flight (being 9 hours 40 mins long) but the staff were so pleasant. On the exit row your table and screen both fold away which means if you don’t want either out then you have ample amount of room to be comfortable. The screens allowed you to pick any film you wanted to watch from a selection of the latest releases (this is a selection of about 30 films), any TV programme they had on there (again there were a lot), you are also able to watch the flight route if you want to see how far into the flight you are. You are also able to play games on these screens, battle ships (which you can play against someone else on the plane!! ), sudoku, who wants to be a millionaire and more. The entertainment choices are endless. I took both my laptop and Ipad onto the plane with me and I only went on my laptop to plan a blog post. 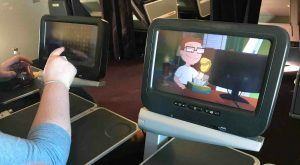 It was the same flying to America as it was to the UK, the entertainment provided was more than enough to keep you satisfied. As for food, well… we made jokes about not needing food for the holiday as we got so much on the plane. 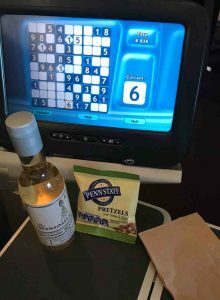 About 15 mins into the flight we are given pretzels and offered a drink (wine, tea, coffee, beer, whiskey, coke, orange juice, water, tonic, and more). Then about an hour after this we are offered our main meals. 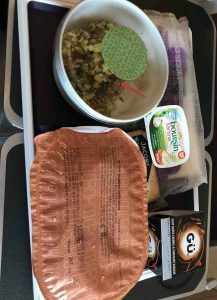 Flying out to America I had; a Quorn cottage pie, which came with a chocolate ganache, a drink, cheese and crackers and a couscous. Flying to England I had; chicken teriyaki served with rice, red velvet cake (the nicest red velvet cake I’ve ever had), bread roll, butter, cheese and crackers and a drink. Then flying back to the UK due to it being an over night flight the lights were turned off and everyone went to sleep. However flying out to America, not long (at least it didn’t feel very long) after our food we were offered another drink, from here we were then offered a mini FAB ice-lolly, then we had afternoon tea. With the afternoon tea (you didn’t have to have tea, we had coke), you were also given crisps, a sandwich and a biscuit. Then around half an hour before landing we were all given a little packet of love hearts. Flying back to the UK, after around 4 hours of the lights being off, the lights were turned back on and we were all woken up for breakfast. Breakfast was a pot of fruit and warm pastries, again served with a drink. Take a look here to see what Virgin offer on their different flights. The flight going out was around 10 hours long, however the flight back to the UK was only 7 hours 20 minutes. This is due to the route that is taken and air traffic, weather etc. The VS075 flight from Manchester to Orlando International was nice, there was a lot of food, the entertainment was great and the staff were wonderful. They were happy, helpful and very friendly. I was chatting to one of them for about 15-20 minutes. As it was our first time going to Orlando she was giving me some tips and suggesting places to go if we want to go shopping etc, which was really nice. The VS076 flight from Orlando International to Manchester was ok, again there was ample amount of food, the entertainment was great however the staff were not as friendly as the previous flight. The two male staff that we had upstairs didn’t smile as much, they were polite but they were not as approachable as the female staff that we had flying out. Nevertheless I would definitely fly with Virgin again, and I don’t know if I could ever do that flight without sitting upstairs in the exit row seats! They are more than worth their money!! 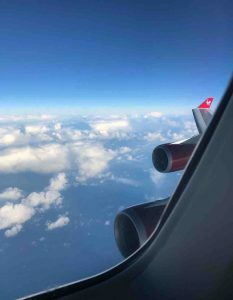 I could not recommend Virgin Atlantic enough to anyone who is doing a long-haul flight, even though a tad more expensive you cannot go wrong with them! 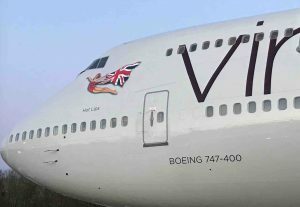 I’ve never flown international before but if I ever do I will definitely be considering Virgin Atlantic! Such a great post with so much information! I hope you had a lovely trip in Orlando! I’ve been there a few times!